For Luke’s birthday last weekend (my child is 18! How did that happen? ), he stuck with the family tradition and requested chocolate soufflés as his birthday “cake.” Our ramekins had somehow vanished, so I bought new ones. 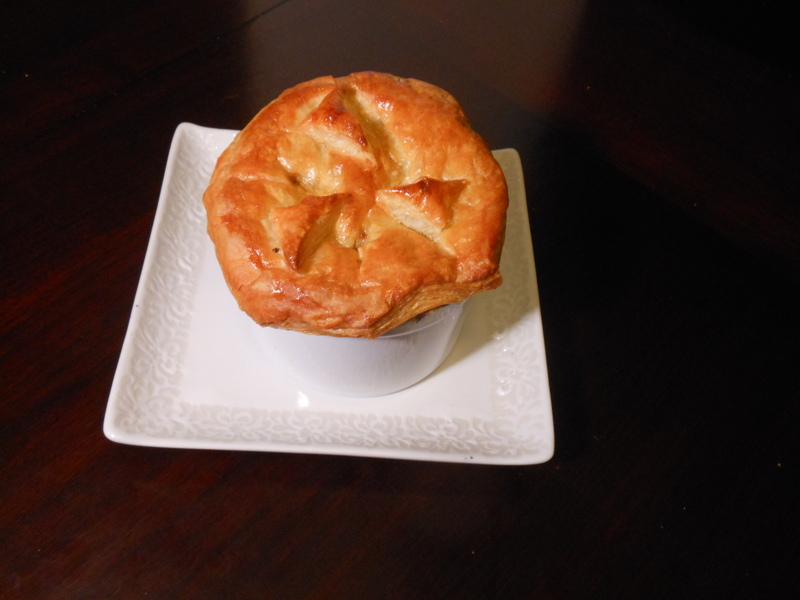 They were the inspiration for dinner tonight – pot pies. My piecrust is of the cardboard variety, tough, bland, and basically inedible. (Resolution for 2013: skip the excuses and learn how to make a respectable crust.) Luckily, thanks to the miracle of modern science, we have the queen of all pastries — puff pastry — in our freezer. I’ve used it for asparagus tarts with great success; now it’s the topping for lovely little pies. Puff pastry does all the hard work for you. Cut it out and drop it over the filling; it fulfills its destiny and reaches lofty heights in the oven: golden,flaky, buttery, light-as-air heaven. 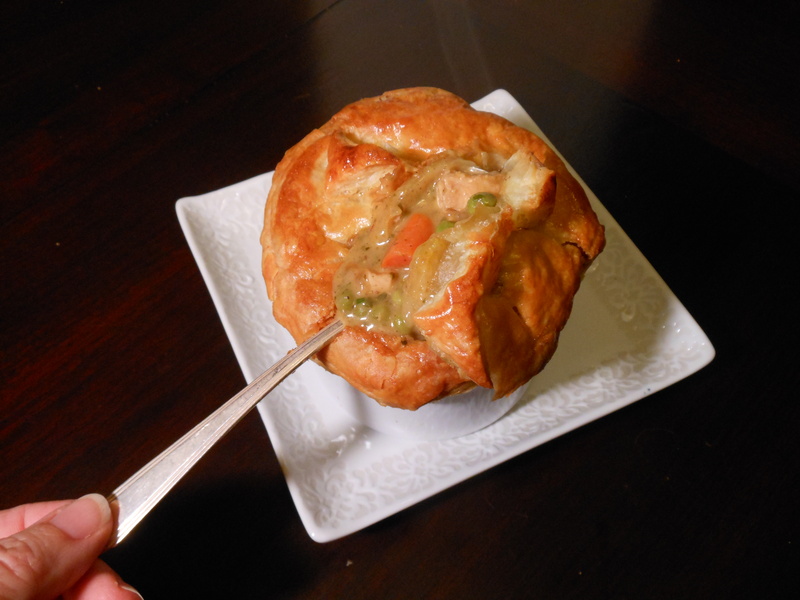 For a first attempt at pot pies, I stuck with the traditional filling of peas, carrots, and chicken. I sautéed the chicken in a skillet rather than poach or roast it. This resulted in a skillet full of those magical browned flavor bits called fond. Cooking the veggies and building the sauce in the pan with the fond incorporates all that deep richness into every bite. Add more chicken if you wish. Skip the cream if you want to save calories, although frankly, you’re using puff pastry, which is a pile of butter disguised with a little flour. The same holds for the parmesan; skip it if it makes you feel virtuous, but it does deepen the flavor. You could certainly make the filling ahead of time and store it in the fridge. Add 10 minutes to the baking time to let the cold pies warm up. Use this technique with leftover turkey and gravy for some darned fancy Thanksgiving leftovers. Heat the oven to 375 degrees F. Set four 8-oz. ramekins on a cookie sheet. Melt the butter with the olive oil in a large skillet over medium-high heat. Split the chicken breast through the middle so you have 2 thin pieces. Season liberally with salt and pepper and sauté in the skillet until browned and just cooked through. Set the chicken aside and add the onions to the pan. Cook for 5 minutes until softened. Add the carrots, celery and garlic; cook for another 10 minutes until softened. Add the flour and pesto, stir well to combine, and cook for 1 minute. Stir in the stock and cream. Cook, stirring, for about 10 minutes until the sauce is thickened and the carrots are tender. Stir in the peas, parsley, and parmesan. Chop the chicken into bite-sized pieces and stir in. Remove from the heat. Roll out the pastry just a little, until the seams are no longer visible. Cut the sheet into quarters. Cut the corners off. Beat the egg in a small cup. Divide the filling among the 4 ramekins. Top each with one piece of pastry, pressing gently on the edges to seal well. If you wish, decorate with the scraps. Cut a few slits in each pastry top. Brush with the beaten egg. Bake for 45 minutes until the filling is bubbly and the pastry is deep golden. Set aside to cool for 10 minutes before serving, to avoid burned tongues. This entry was posted in main courses, meat, poultry,and fish and tagged carrots, chicken, comfort food, individual servings, pastry, puff pastry. Bookmark the permalink.